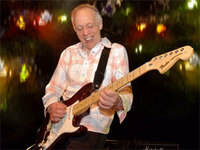 Kudos to Strat-O-Blogster for spotting this: NPR did a live interview with Robin Trower yesterday that included some great in-studio performances with his band. Trower is one of my all-time favorites. That cream-colored strat you see in the upper-left of this page? Yeah. Total Trower-fanboy purchase.